This book offers an accessible and broadly conceived introduction to social psychology. Written in a lucid and lively style, it assumes no prior knowledge of the field, and is the ideal textbook to get students thinking about the subject. The volume covers the main issues of social psychology ? as well as many classic studies ? such as self and personality, interpersonal relations, language and communication, altruism and aggression, group processes, attitudes, and intergroup relations. What sets this book apart is its coverage of less orthodox topics which are often neglected in introductions of this kind. These areas include emotions, social and moral development, social representations, health and illness, employment and unemployment, and the implications of these fields for social policy. The result is an unusually rich and wide-ranging presentation of social psychology, drawing together a deliberately varied range of methodology and theory. 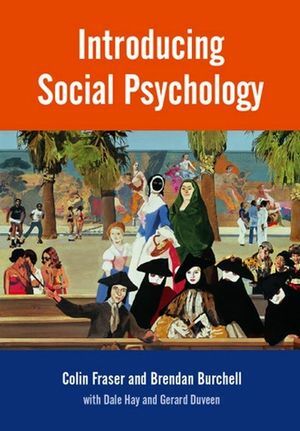 The currently dominant cognitive and psychological approach to social psychology receives systematic consideration in a number of chapters, but its focus on individuals and face-to-face interaction is continually related to broader social concerns and contexts. This is achieved through the use of cross-cultural and historical comparisons, together with an awareness of the contributions that can be made by related social sciences. The authors aim to show that social psychology illuminates the whole of social life, including everyday issues faced by all of us. Colin Fraser is a Fellow of Churchill College, Cambridge, and was formerly a University Lecturer in Social Psychology at the Faculty of Social and Political Sciences. Brendan Burchell is a University Lecturer in the Faculty of Social and Political Sciences at Cambridge University, and a Fellow of Churchill College. Gerard Duveen was formerly University Lecturer in Social and Developmental Psychology at the Faculty of Social and Political Sciences at Cambridge University, and a Fellow of Corpus Christi College. Dale Hay is a Professor in Social Psychology at the University of Cardiff. PART I: The Social Individual. 2. Personality and the Self. 3. Cognition and Social Behaviour. PART II: Social Interaction and Relationships. 6. The Development of Social Relationships. PART 111: Understanding the Social World. 10. The Development of Moral Reasoning. 11. Perceiving and Understanding People. 13. Attitude Organization and Change. 15. Prejudice and Intergroup Relations. 16. The World of Paid Work. 18. Social Psychology and Policy. PART V: The Nature of Social Psychology. 20. The Nature of Social Psychology.